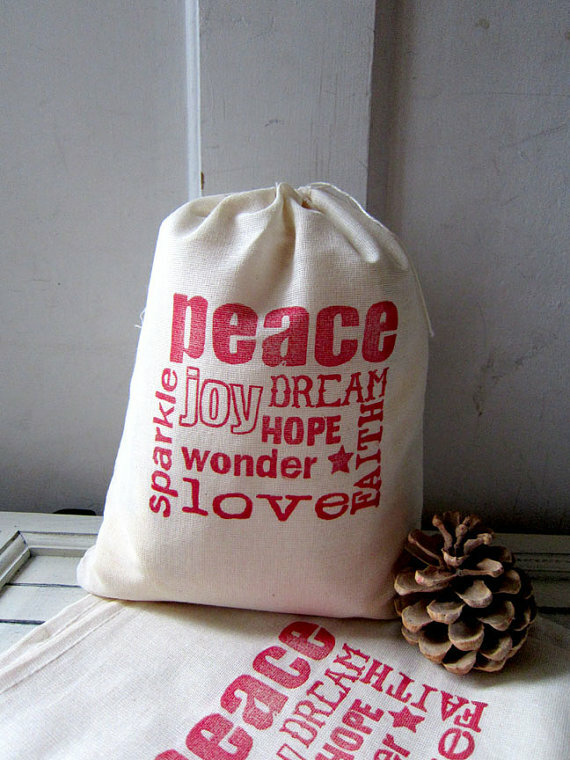 For those of us who never learned to do great gift wrapping — or who simply don't want to spend the time on it — gift bags are a wonderful thing. And while even gift wrap paper can be reused, a good bag is ever more likely to have a second life — or third, fourth or fifth. The gift bags from Quotes & Notes are cotton muslin drawstring bags that have been hand block printed. Fun Bags For Everyone has a large selection of holiday gift bags, in three sizes. The store owner says: "My mother was a professional seamstress. She taught me how to sew over 35 years ago and bought me my first sewing machine which I’m still using today. My favorite item to make these days is fabric gift bags. ... 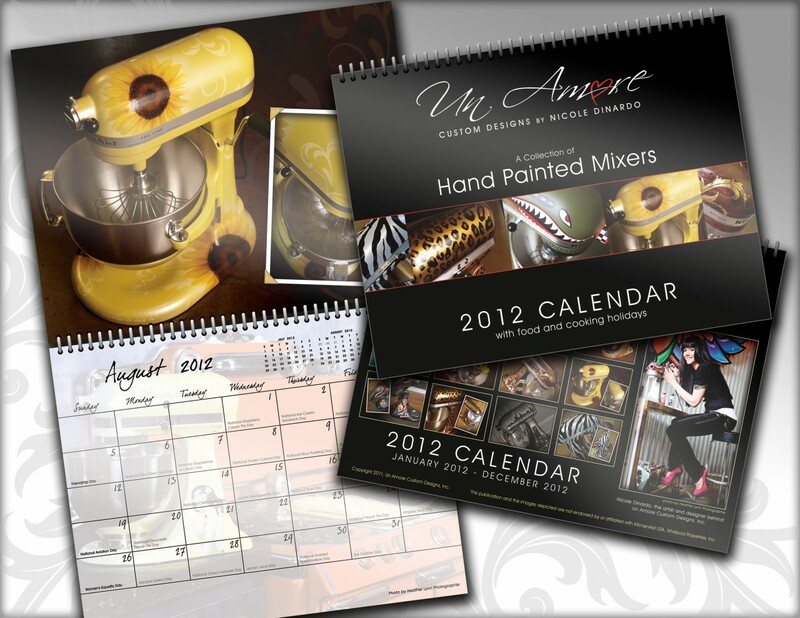 They are washable and reusable and last for years which eliminates a lot of paper and waste." 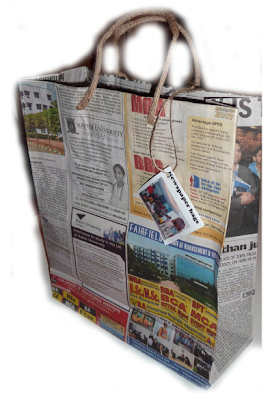 The gift bags from Globally Cute are made from recycled Indian English-language newspapers. They may not be as durable as some of the other options, but they sure are interesting! This "origami fabric gift bag" is just one of the many Christmas holiday bags — including wine bags — from Goose's Bags and Gifts. 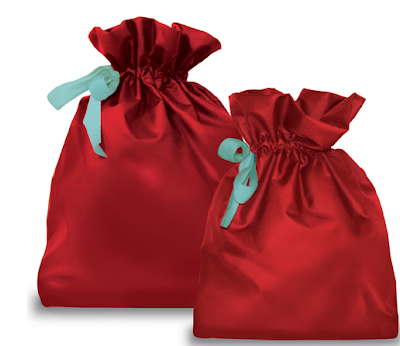 There are also plenty of bags, in four sizes, that are not specifically for Christmas. 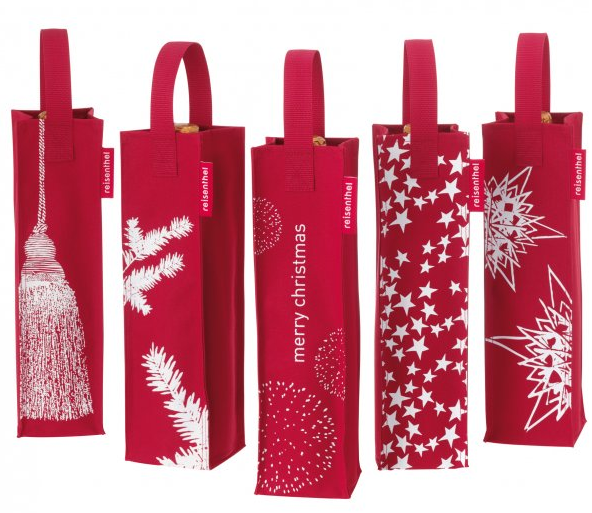 Speaking of wine bags: For those giving wine — a nice consumable gift — there are many cool choices. 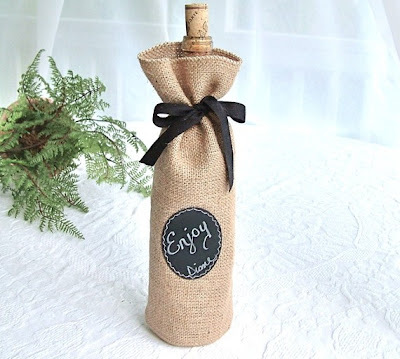 Diane Sudhoff of South House Boutique makes jute (burlap) wine bottle gift bags with a chalk cloth label you can use instead of a gift tag. 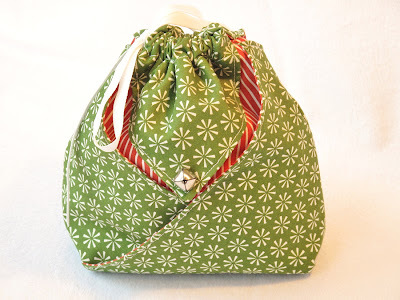 I can't find Reisenthel's bottlebags on the Reisenthel web site, but they are available from Touch of Europe in the U.S., and here for those in Europe. 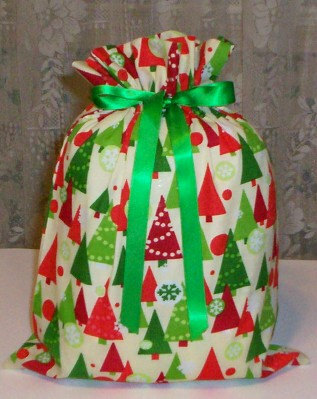 Wine Wear is another fun way to wrap a wine bottle. There are many designs, not just holiday ones, but I decided to show you the one called Christmas Sweater. Do you have old strings of lights that are damaged? Have you changed the style you use, perhaps by switching to LEDs? If so, you probably want to look into ways to recycle those lights you no longer want; they don't have to go to landfill! There are a number of programs which handle Christmas light recycling; these are just some of them. Local Programs in the U.S.
"A portion of the proceeds from the 2011-2012 Holiday Light Recycling Drive will go to Operation Food Search to feed the hungry." The program runs at 58 Walmart Stores from Nov. 19 through Dec. 4, 2011 and at other locations from Nov. 19, 2011 through Jan. 31, 2012. 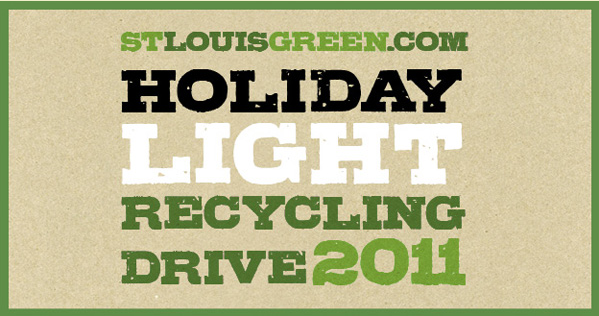 "Recycle Your Holidays is a one-of-a-kind statewide holiday light recycling program in Minnesota. Residents can drop-off their unwanted light strands at one of our 400+ participating locations during the holiday season starting November 15 and running through the end of January each year. "This program employs over 200 individuals with developmental disabilities at vocational centers throughout the state of Minnesota. Every bulb of the light strand is dismantled by vocational center clients and then properly recycled in Minnesota." "Lisle has partnered with Elgin Recycling who will strip the lights and recycle both the copper and plastic materials. No parts will be shipped overseas." 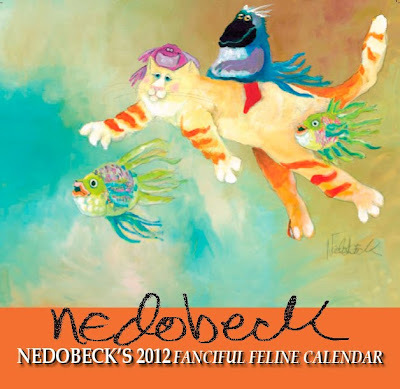 The Lisle program runs from Dec. 3 through the end of February 2012. 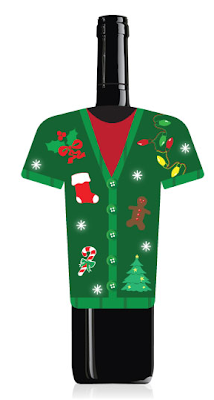 "Throwing away those old light strands is... well, not green - which means, that's not the holiday spirit. All that plastic and wire pretty much never decomposes - so when you throw it in the garbage, it goes to the landfill, and sits there... maybe forever." This program will "swap your old lights for a $5 gift certificate redeemable for purchases over $20." This program was launched by Victoria Cambron, a 14-year-old member of Henderson County’s 4H Leaders-In-Training club. She says, "We collected 213 pounds of lights last Christmas season. The monies collected were donated to Bounty of Bethlehem and St. Gerard House in Hendersonville. It was great to keep the lights out of the landfills but it was even better to be able to give the money to two very worthy causes in our own community." Lights are being collected again this year; the dates aren't mentioned. RecycleWorks lists places in San Francisco, Oakland and Redwood City where you can bring in light strands. Mail-In Programs in the U.S.
"Send us your old Christmas lights for recycling and we'll send you a coupon good for 25% off HolidayLEDs.com LED Christmas lights." The company explains exactly what is done with the old lights: "When we receive your lights for recycling we will remove them from the package and recycle the box. The lights will be processed and any material that cannot be recycled (i.e. loose bulbs) is discarded. Once we have collected a substantial number of sets we take them to a 3rd party recycling facility located in Jackson, MI. The recycling company puts the lights through a commercial shredder, which chops the lights up into little pieces. The pieces are then further processed and sorted into the various components that make up the lights (pvc, glass, copper.) The materials are separated and transported to a region center for further processing. In some cases, the pvc cannot be recycled." This company offers a coupon for 10% off when you mail in your lights for recycling. "We will send you a coupon for 10% off any of our Five Star services and we will also donate a portion of any proceeds to Toys for Tots." This company will email you a discount code good for 10% off a single order of Christmas lights. We've found a local recycling company who will take your lights and recycle the copper, glass and plastic. They pay a small amount per pound of lights - like the money you get for aluminum cans - which we thought we'd put that to good use for you. By sending us your lights, you can join a force for literacy! All proceeds from the Christmas lights recycling program will be used to purchase Usborne books that will be donated to the Marine Toys for Tots Foundation. Since Usborne Books offers a 50% match on donations, for every $100 in proceeds from Christmas lights recycling, $150 in fun, educational children's books will be purchased and donated to the Dallas/Fort Worth Marine Toys for Tots center. Can Christmas tree lights be recycled? Recycle Now says yes. "They are accepted at recycling centres. Some councils have special collection bins for small electrical items at other sites too, e.g. supermarket car parks." "By recycling your old lights instead of tossing them out, you're not only saving space in our landfills, but recycling a valuable resource that can be smelted into new metal." "The strings brought to the depots are picked up by Planet Earth Recycling Ltd, delivered to Davis Trading in Vancouver, baled and exported for processing where the copper is recovered for new use in wiring and plumbing." 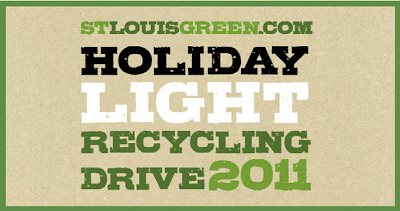 Anyone have information about other Christmas light recycling programs — perhaps in your part of the world? Update on Dec. 28, 2011: Read about the Chinese factories that recycle these lights into slipper soles and more. Today is both Black Friday and Buy Nothing Day. 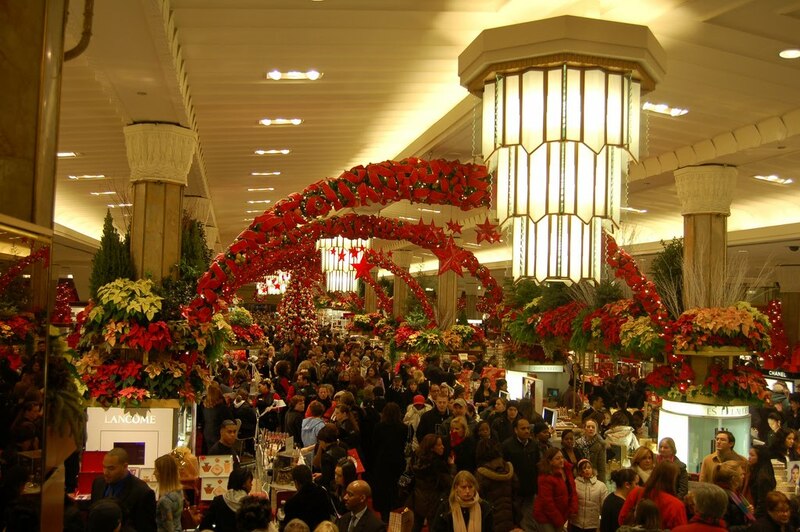 Those who have no intention of going near a mall today can still do some online holiday shopping if they don't choose to "buy nothing" — and they can get gifts that won't create clutter. 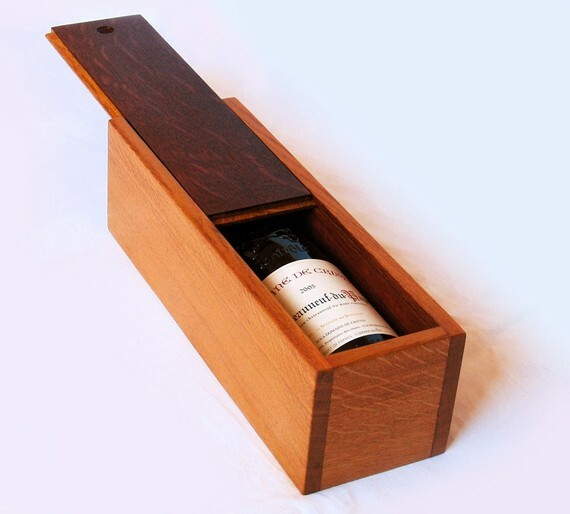 I've mentioned many such gifts in past years, and have now pulled them all out into a gift giving ideas label so you can find them all easily. (Kiva fans: Yes, I've mentioned Kiva in the past.) But, of course, I have some new ideas. 1. Give the gift of online backup. I use CrashPlan, which has gift subscriptions, currently discounted. 2. Give a New York Times digital subscription. The online version of the New York Times now has a paywall, limiting how much you can see for free. To get unlimited access, you need to subscribe — and gift subscriptions, which come with either a smartphone or a tablet app, are on sale right now, too. Most adopt-an-animal programs are benefits for zoos, conservation groups, etc. This one is different; it comes from Caroline at Llama-Rama in Somerset, in the U.K., who says: "The majority of my llamas have been re-homed from people who just cannot keep them any more. These are all conscientious owners who have had drastic life changes: death or divorce in the family, health problems, ageing, house moves and military deployment." 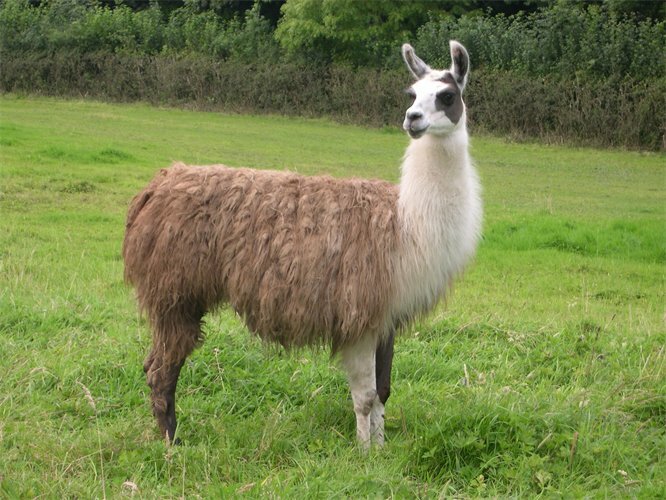 This is actually the gift of experience, as Caroline explains: "Unlike many other adopt an animal schemes, you will also get the chance to come and spend a session (by appointment) with your chosen animal. Helping to feed, groom getting to know them and perhaps even getting the chance to take one out for a walk." 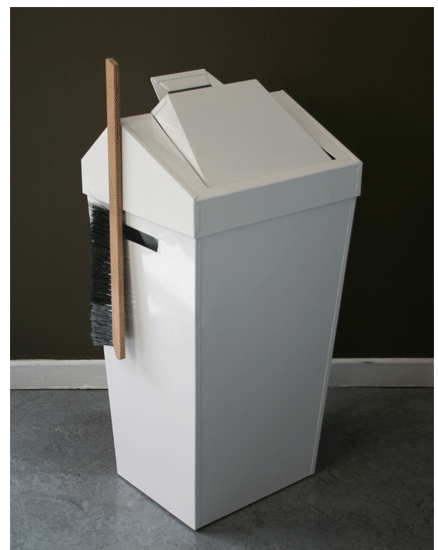 Want to make it easy to keep clutter at bay? One strategy is to have plenty of wastebaskets — which can also serve as recycling bins — throughout your home or office, so there's always one handy. 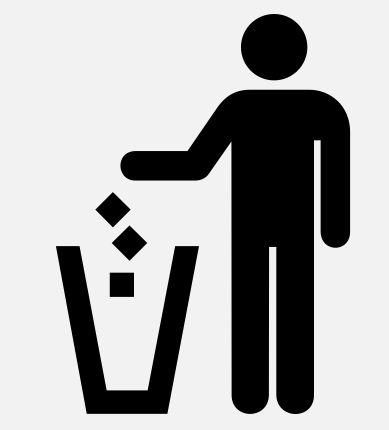 And while I've found many delightful wastebaskets in the past — see that list of related posts — I've now found even more. 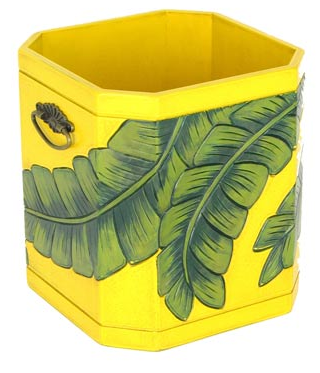 Let's start out with a splash of color with this wastebasket from Wayborn, available through Bellacor. 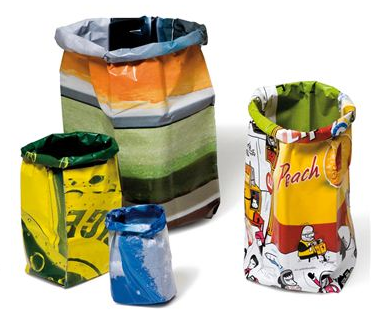 These Paperbag wastebaskets, designed by Jos van der Meulen and manufactured by Goods, are made from unused billboard posters. In the U.S., you can find them at Switchmodern and Greener Grass Design. 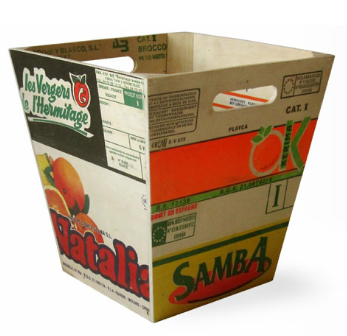 On a similar note, Kay + Stemmer made some limited edition wastebaskets from recycled fruit boxes. 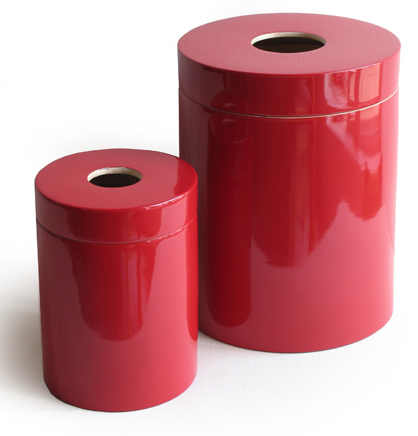 Ekobo makes bamboo trash bins in two sizes and eight colors. One place to buy them is Matteria. John Robshaw Textiles has foldable wastebaskets in three patterns. 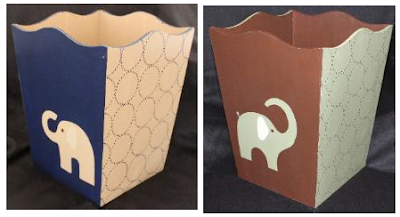 Camille Love Designs has a number of trash cans, most of which don't appeal to me — but I do like these elephants. 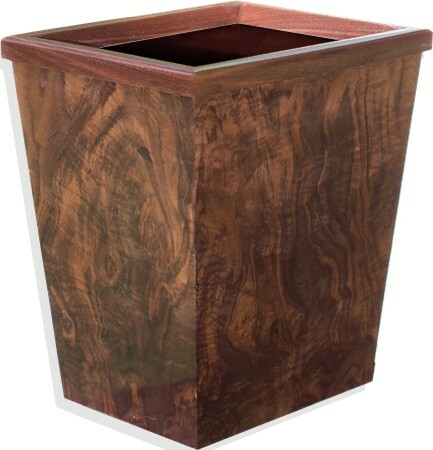 RJ Fine Woodworking has wood wastepaper baskets in two sizes, made from various woods; the one above is made from American walnut burl. 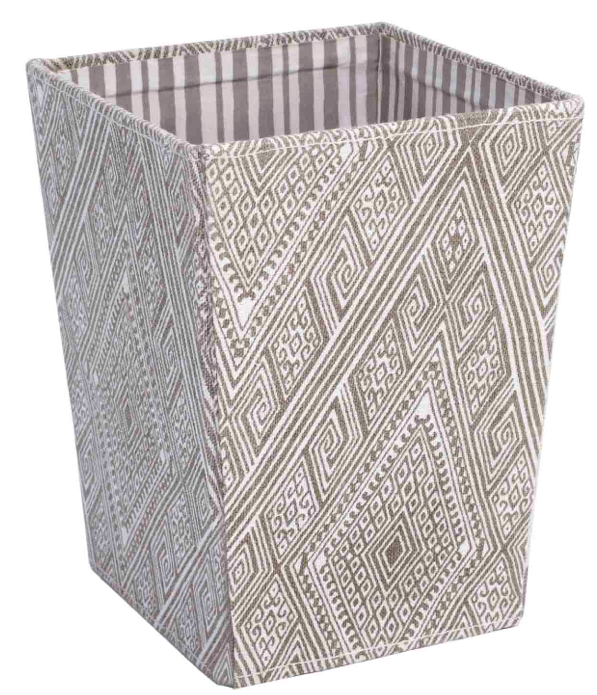 If you have $1,000 or so to spend on a wastebasket, you might like the ones from Fornasetti. You can find them at Palazzetti andUnica Home. There's so much to like here, starting with the labeling — including the idiosyncratic "auditory pablum." 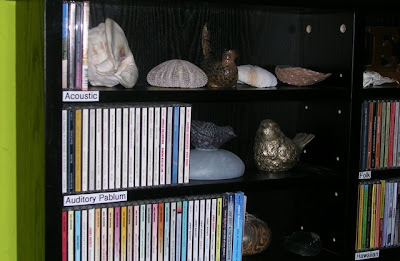 But I also love how the carefully curated collection of shells and artwork shares the space with the CDs, and how these pieces serve as bookends. 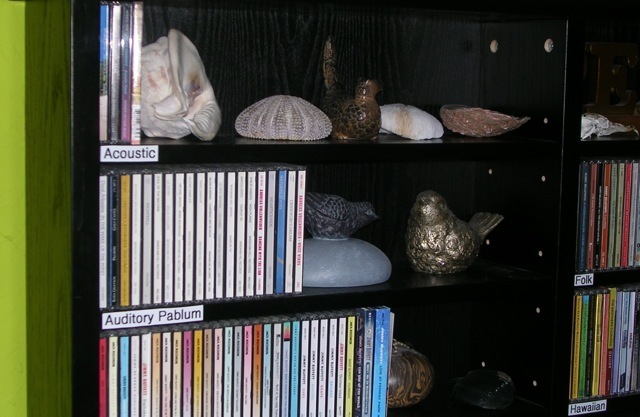 And I can see that the shelves are adjustable, so this piece of shelving can readily be used for something other than CDs if Barbara so desires in the future. I find images like this to be much more inspiring than those you see, in magazines and on TV, of perfectly organized spaces —because it's real and has tons of personality. 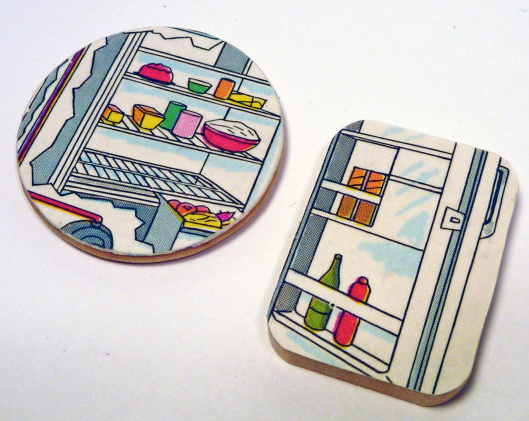 Want some nice magnets you won't need to remove from the fridge when your Mom visits? Let's start out with the set above, from Katie of Kitschy Hippo. Katie's magnets are made from vintage ephemera, so they are one of a kind. Ray Troll has a large selection of magnets with a fishing theme. Snug, located in Hannover, Germany makes umbrella magnets from wood; you can also get matching raindrops. Snug also sells the umbrellas through Etsy. 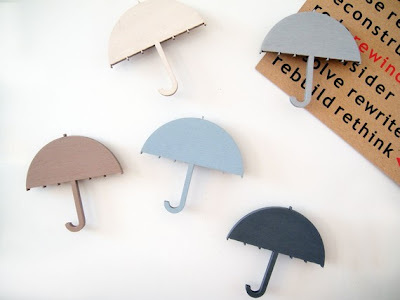 [via the Lolalina gift guide, in turn found via Jess Constable] Update on June 24, 2014: I'm not finding the umbrellas on the Snug Studio website or Etsy site, and I'm not finding the raindrops anywhere — so they may be discontinued products. 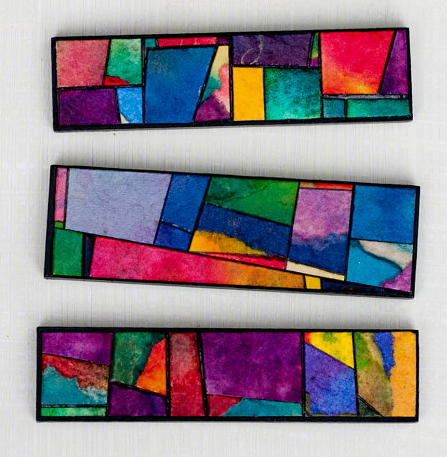 You can get magnets covered with handmade paper from Meg Bollinger of Calyrew. And finally, for Facebook fans: Fridgebook magnets. 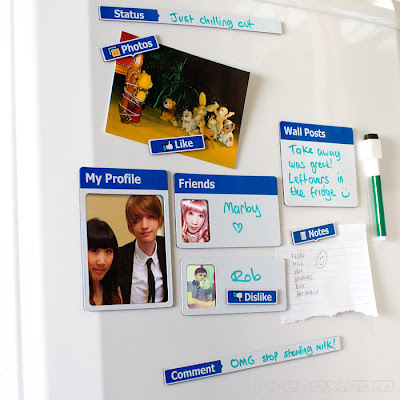 They come with a dry erase pen for making wall posts, etc. 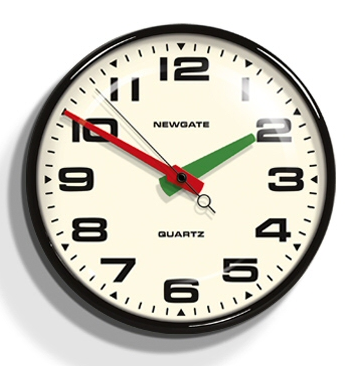 If you'd had any of these clocks a few days ago, you'd have had another clock to reset for the end of Daylight Saving Time — but they're so nice, you might not have minded. 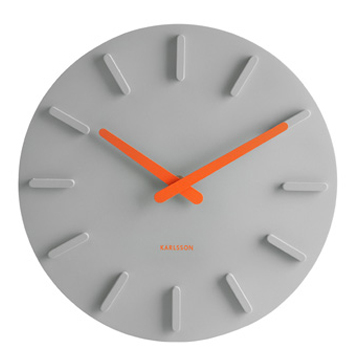 The one above is from Karlsson, which makes a large range of wall clocks. 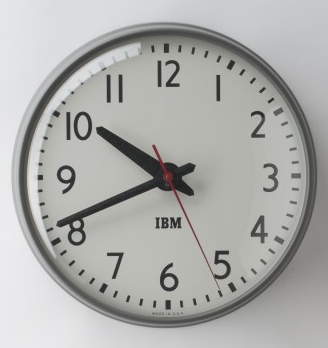 Karlsson is now owned by Present Time, and I first found the company's clocks on the Present Time web site. 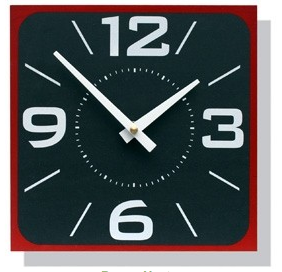 Present Time doesn't list this specific clock, but does have many others. 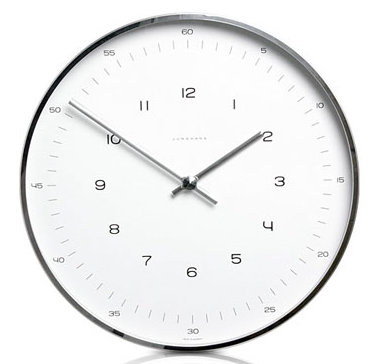 I did find this specific clock on Amazon's stores in the UK and France — and Karlsson has dealers around the world. 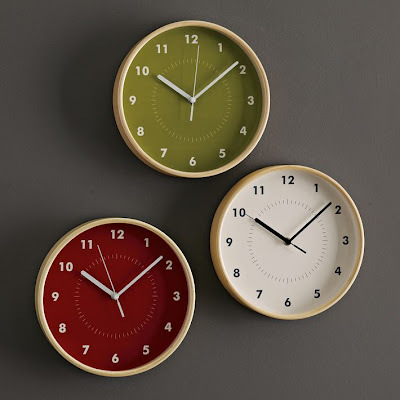 This clock is made from recycled coffee cups! 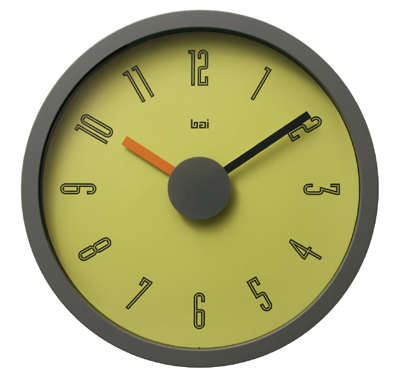 And finally, let's admire the wall clocks from Thomas Bai. Have some rings that need a proper storage place — one that keeps them out on display, because that's the type of organizing that works for you? Let's look at some of the many ring holders that might meet your needs. The item above, a combination ring holder and jewelry box, is sold by Mjölk, in Canada. 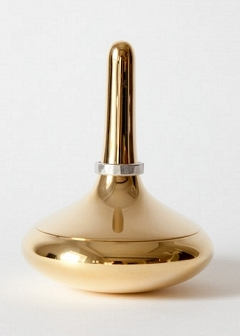 Update on Nov. 9, 2011: This ring holder comes from Skultuna, a brassware company in Sweden; it can also be purchased from twentytwentyone. 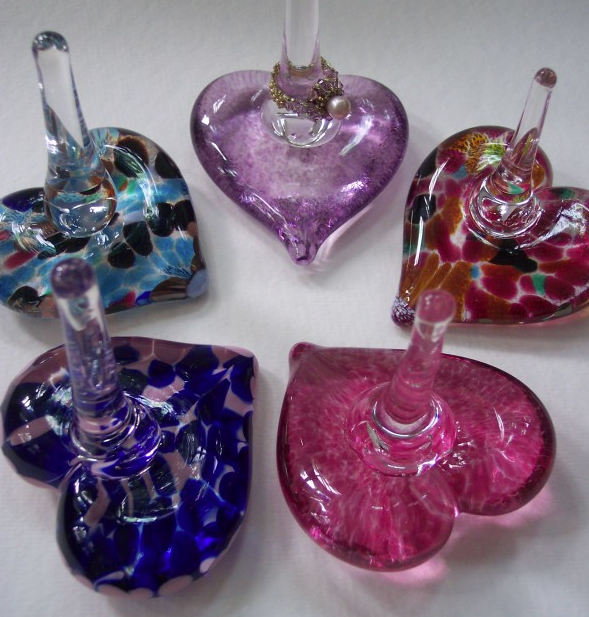 Rebecca Zhukov of Providence Art Glass makes some lovely ring holders. 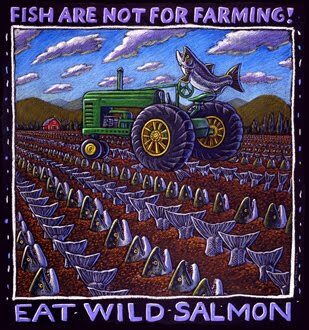 You can buy them online from the Carlyn Galerie. Update on May 31, 2011: I'm not currently finding these at the Carlyn Galerie. Prefer stoneware? 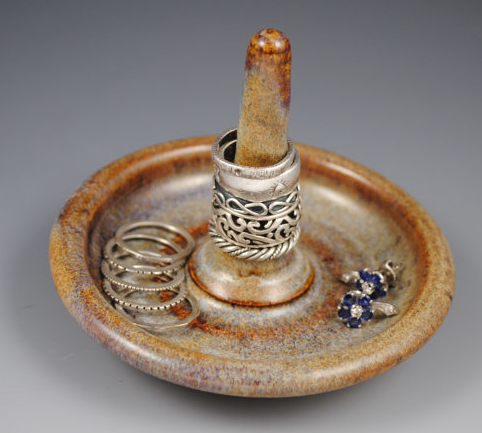 Neal Pottery makes some nice ring dishes. 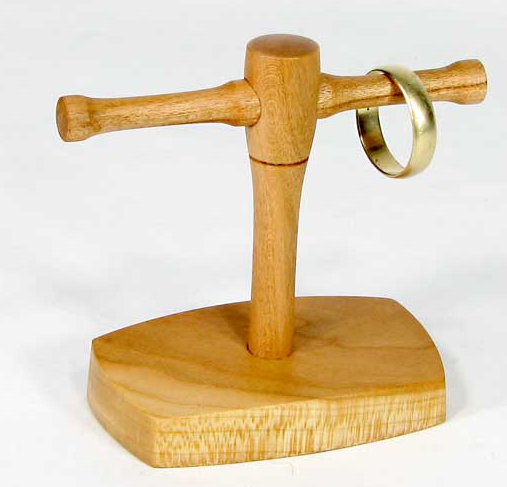 Dale Randles of Artistree makes ring holders carved from branches. 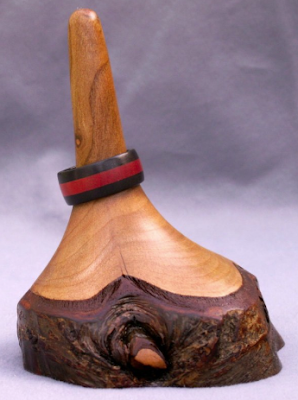 Finally, Barclay Fine Woodworking has this horizontal ring holder. It's available in cherry or walnut. I was working with a client recently who was replacing the item shown above — what her computer used to be plugged into — with a decent surge protector. But even her new surge protector may not be providing the protection she thinks she's getting — something I just learned thanks to David Douthitt, who got me reading Power, Surge Protection, PCs, and You by Jeff Atwood. That article made me want to learn more, so I went on to read what This Old House and How Stuff Works had to say. 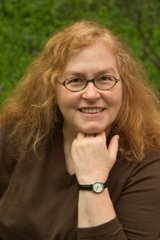 Now I'm beginning to understand this subject, and I'm looking at what changes I may want to make to my own home, and suggest to clients. I've always had my computer and my stereo equipment on a surge protector — and it's a good thing, because I've had one go dead after it protected my computer. (Another lesson: Have a spare surge protector on hand, so if one goes out, you can replace it and keep using your equipment, even if the stores are closed.) I added a surge protector to a lamp that proved to be especially susceptible to surges, after paying for repairs a couple times. And when I stayed with friends in Paris, I bought a surge protector to use while charging my iPhone and iPad. But here are some things I either never thought about, or forgot. 1. It's not just the computer and the home theater you might want to protect. As This Old House explains, lots of expensive electronics that you might not think about can be hurt by power spikes or surges: that Sub-Zero refrigerator, for example. 2. Surges can be caused by things inside our homes. This Old House explains that surges can be caused by "cycling on and off of laser printers, electric dryers, air conditioners, refrigerators, and other energy-sucking devices in the home." How Stuff Works elaborates, noting that while people worry about lightning, "A more common cause of power surges is the operation of high-power electrical devices, such as elevators, air conditioners and refrigerators. These high-powered pieces of equipment require a lot of energy to switch on and turn off components like compressors and motors. This switching creates sudden, brief demands for power, which upset the steady voltage flow in the electrical system. While these surges are nowhere near the intensity of a lightning surge, they can be severe enough to damage components, immediately or gradually." 3. Not all surge damage is immediately obvious. See that part about gradually in the prior item? Here's what This Old House says: "The damage inflicted by these minor power fluctuations can be instantaneous — but may not show up for some time. 'You might not even notice it,' says Andy Ligor, a consultant with A.M.I. Systems Inc., a firm that installs both residential and commercial surge-protection systems. 'Then a year or so later your microwave stops working.'" And Surgeassure, another company providing surge protection, says: "Surges are caused most often from utility disturbances and internally generated surges. It is common for homeowners to lose equipment due to surge damage and not even realize it. Many 'mysterious' computer problems such as contaminated or irretrievable files are actually due to electrical surges. Also, breakdowns and replacements of electronic equipment due to what you think of as 'normal' wear and tear may actually be due to internally or externally caused surges." It's not just surge protection vendors who say this, either. Here's Jeff Atwood, quoting Dan's Data: "Spikes are the real nasties. A spike is a brief increase in the supply voltage — less than 2.5 seconds, often a lot less. For a fraction of a second, a spike can easily subject your equipment to several hundred volts. If this doesn't blow something up outright, it can progressively damage power supply and other components. So, after a few (or a few hundred) more spikes and surges, your PC dies, for no obvious reason. You may lose a power supply or modem; you may lose your motherboard; you may even lose your hard drive and everything on it." Photo by Jerry / ww_whist, found on Flickr, licensed through Creative Commons. 4. Phone and cable lines matter, too. 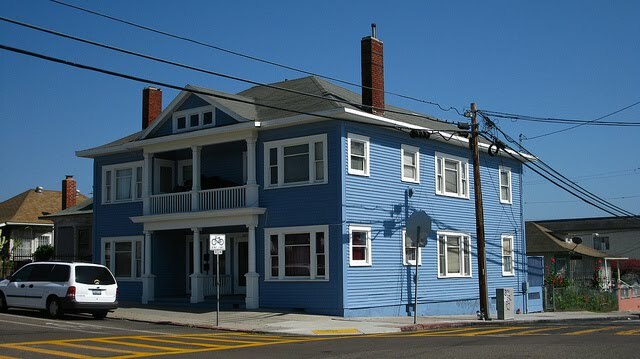 As This Old House says: "A surge will follow any wire into a house — phone and cable lines included — and threaten fax and answering machines, televisions, satellite systems, computers, and modems." And How Stuff Works elaborates: "Even if you connect surge protectors to all of your outlets, your equipment might be exposed to damaging surges from other sources. Telephone and cable lines can also conduct high voltage — for full protection, you should also guard against surges from your telephone or cable lines. ... If your computer is connected to the phone lines via a modem, you should get a surge protector that has a phone-line input jack. If you have a coaxial cable line hooked up to expensive equipment, consider a cable surge protector. Surges on these lines can do just as much damage as surges over power lines." 5. The best protection comes from using a whole-house system plus those individual protectors we're used to using. I'd forgotten about whole-house systems until I was chatting with website developer Kevin Henney yesterday, who mentioned them to me. And then I remembered that I'd heard about them before from the folks at Positive Electric, who seem to use the Surgeassure products. 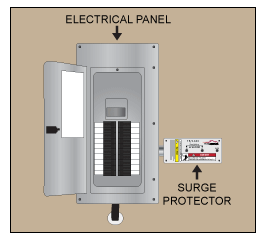 That picture above is the company's illustration of a breaker panel surge protector. As This Old House says: "Guarding against surges requires a two-pronged approach: a whole-house suppressor to tame the big, dangerous power spikes and an individual circuit (or 'plug-in') surge suppressor for vulnerable appliances and electronic devices. ... By themselves, whole-house suppressors can't stop surges completely; up to 15 percent of excess voltage may leak by. That's where 'plug-in' surge protectors come in." 6. It pays to invest in good surge protectors. I'll let you read This Old House yourself to get the ratings to look for. But here's something it's easy to overlook, as explained by State Farm: "Select a point-of-use surge protector that has an indicating light and/or audible alarm to show when it needs a replacement." 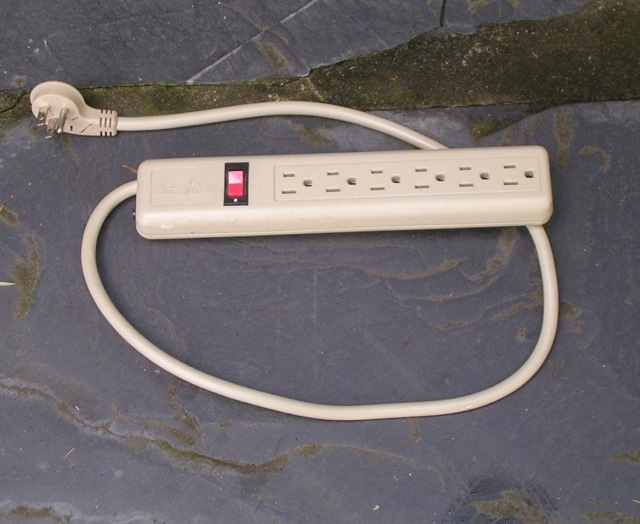 Note that the indicator light mentioned is not the same as a simple "power on" light; the surge protector might still power on and serve as a basic power strip even if the surge protection components have burned out. 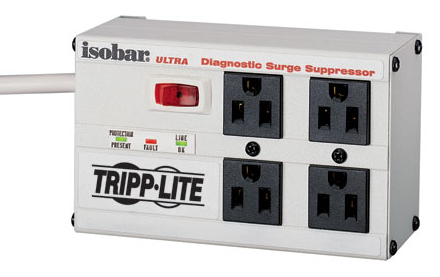 The Tripp Lite ISOBAR Ultra series are what Atwood recommends. You can also get a UPS — an uninterruptible power supply; some of these include surge protection. How Stuff Works suggests that a basic UPS, just by itself, is probably not the way to go: "An ordinary UPS WILL give you a high level of protection, but you should still use a surge protector. A UPS will stop most surges from reaching your computer, but it will probably suffer severe damage itself. It's a good idea to use a basic surge protector, if just to save your UPS." Update: Note that some say plugging a UPS into a surge protector is a bad idea.